PANAJI, INDIA--(Marketwired - Nov 3, 2016) - Goa Marriott Resort & Spa announces that its acclaimed restaurant, Simply Grills, is now open for another season. Offering the region's freshest and tastiest seafood, fresh catch of the day, exclusively sourced premium meats, organically grown local vegetables, and homemade oven fresh bread, the eclectic restaurant highlights the best of the Goa region. Experimenting with concepts, yet maintaining a farm-to-fork philosophy at its core, the restaurant has even revised its rates to offer more value. This favorite outdoor dining spot for locals and out-of-towners alike serves up sizzling steaks and barbeque in an interactive experience. Situated poolside at our hotel in North Goa India, close to Miramar Beach, the restaurant's live kitchen showcases the resort's renowned chefs in action as they take centre stage, crafting exceptional and varied dishes. Opening at 6:00pm, an hour earlier than previous years, allows guests to soak up the beautiful sunset backdrop in an intimate, vibrant Goa locale. Simply Grills' philosophy starts with fresh ingredients, simply prepared to preserve flavor and create meals to die for. Take your pick from the haul of the day, pair it with your choice of treatments and accompaniments and let our resort's culinary team do the rest. Or, simply sit back, place yourself in the hands of our accomplished chefs and go by their recommendations. On select days the menu could feature fresh oysters and free range Brazilian beef. Crabs are another popular favorite, and guests can choose from a range of fresh seafood like pomfret, snapper and lobster. Savor premium meats like pork, tenderloin and German sausages or even seasonal vegetables if you prefer. Mix and match with your favorite marinades like BBQ, pepper sauce, Cajun spices or Goan masalas, and accessorize with sides like grilled exotic veggies, mashed potatoes and tomato-arugula salad. For more information, to book a hotel deal or to reserve a table at our acclaimed restaurant in Goa, please call +91-832-2463333. Centrally located in Panaji, Goa, the Goa Marriott Resort & Spa offers a beautiful waterfront location, well-appointed accommodations and personalized service. Travelers can rest easy in their spacious guest room or suite while enjoying perks like plush, luxurious bedding and sprawling views of the water. Guests can spend days getting pampered at the hotel's on-site spa, staying healthy in the fitness centre or unwinding with a drink poolside. Visitors are delighted to learn that the hotel offers an array of dining options, from traditional Indian cuisine to chef-inspired international fare. The Goa Marriott Resort & Spa seamlessly blends business with leisure and offers 14,000 square feet of flexible event space for corporate gatherings and celebrations. 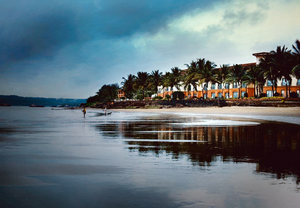 The five-star experience that is the Goa Marriott Resort & Spa is truly unforgettable. Goa Marriott Resort & Spa announces that its acclaimed restaurant, Simply Grills, is now open for another season. Offering the region’s freshest and tastiest seafood, fresh catch of the day, exclusively sourced premium meats, organically grown local vegetables, and homemade oven fresh bread.